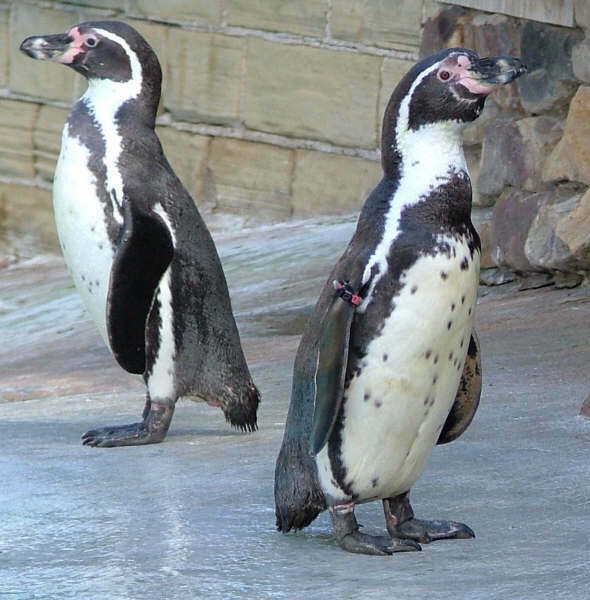 The nearest relatives of the Humboldt Penguin are the African Penguin, the Magellanic Penguin and the Galápagos Penguin. This breed of penguin is named after the cold water current it swims in, which is itself named after Alexander von Humboldt, an explorer. Humboldt Penguins nest on islands and rocky coasts, burrowing holes in guano and sometimes using scrapes or caves. In the Bird Garden we have a colony of 13 Humboldt penguins. The first penguins of the present group arrived in August 1989, and two are still here and doing well at just over 25 years of age. The penguin enclosure was specifically designed to replicate the coastline of Peru in South America where the Humboldt Penguins are from. The swimming pools are different depths and areas, and there is a rocky slope leading to a plateau. In the wild, they nest in rocky scrapes and sea caves, among boulders and in burrows along islands or rocky sections of the coast. At Harewood, we’ve built stone huts to mimic these nest burrows. There are more nests than we need, giving the penguins lots of choice. We also supply twigs for nesting material to make sure the birds are as comfortable as possible. 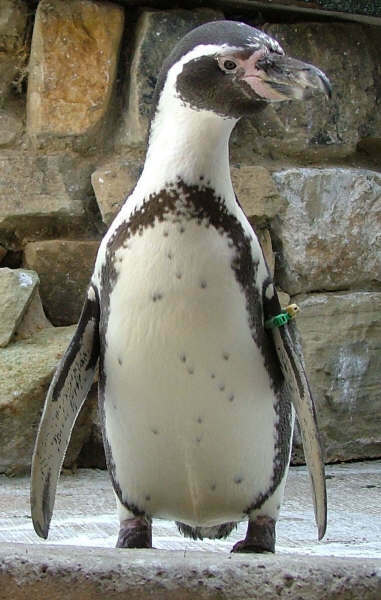 The adult penguins have a unique pattern of spots on their white chest area, which is like a fingerprint and stays the same throughout their lives. Some visitors to Harewood know which ‘their’ Penguin is from the pattern. Each penguin has a red, yellow, blue, green or black coloured wing tag-on the left wing for a female and on the right wing for a male showing which family group it belongs to. Humboldt penguins originate from Coastal Peru and Chile. Both sexes are similar with males slightly larger than females. Chicks hatch in a dense coat of down, which later changes to a denser down layer. Chicks moult into their juvenile plumage before they are two to three months old, when the grey down is replaced by water-repellent plumage. 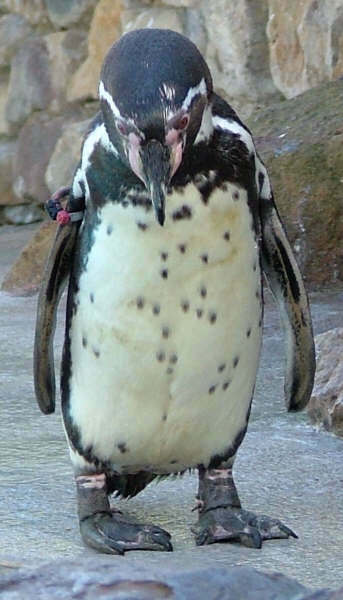 The immature penguins have a brownish head with greyer cheeks and lack the white head stripe and black horseshoe shaped breast band of adults. They have a grey iris which changes colour later on when they gain full adult plumage. In the wild the Humboldt penguin feeds on anchovies, squid and sardines that are found in the Humboldt Ocean current of the West coast of Peru. At Harewood we feed them whitebait and sprats, fish that are similar in size to their natural diet, although they will also eat small Herrings. They usually feed just after sunrise at a depth of around 1 metre. The penguins have supra-orbital glands at the base of the beak, which in the wild enable them to deal with the extreme levels of salt in their diet. The excess salt is excreted in a concentrated saline solution, which tends to dribble down the bill. At Harewood we give the penguins salt and vitamin tablets with their fish. Penguins have a uniform covering of feathers over their bodies, unlike most other birds, which have alternating feathers and bare tracts. The feathers overlap each other, in order to improve their performance in both insulating and waterproofing the body. This plumage is highly wind resistant and remains smooth and compact in winds upwards of 60km/h. 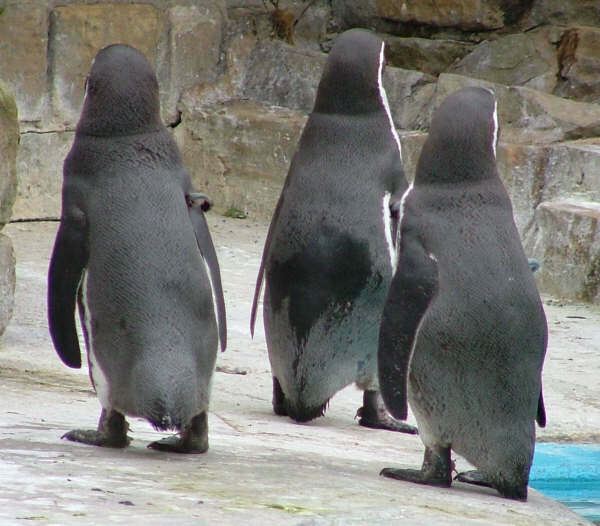 Humboldt penguins moult their feathers in one go, over several weeks. During the moult Penguins tend to eat a lot more fish and as a result put on almost 31% extra weight. The old feathers then fall out and are replaced by new ones. By the time the new plumage is fully waterproof the penguins have lost all their extra weight. For about 20 days, until the moult is complete the penguins have a scruffy, moth eaten look. They can swim at speeds of up to 2.4 meters a second in captivity compared to 1 meter a second when hunting for food in the wild, and the maximum recorded dive was down to 80 metres deep. Unlike most water birds penguins do not use their feet as paddles, but it is their wings that provide the propulsion, along with the tail for steering. Penguins have solid heavy bones, as weight is not an issue because they only fly underwater, not through the air. Normally, body weight is just slightly less than the volume of water a penguin displaces, so it’s easy for them to dive and swim in the water. Humboldt penguins usually stay under water for around a minute, before coming up for breaths, but can manage up to around two minutes, depending how deep the anchovies are that they are hunting for. Get up close to the penguins by booking a Penguin Feeding Experience.